RAMALLAH, West Bank — Her back to the camera, a Gaza woman ashamedly unbuttons her dress before a female Israeli soldier, revealing that her breasts were removed in a failed attempt to halt cancer. In this climactic scene in “Fatenah” – the first serious Palestinian attempt at animation – the heroine flunks the security check and isn’t allowed to enter Israel for treatment. The 30-minute film is inspired by the story of a Gazan woman whose battle against breast cancer included fighting inept Palestinian doctors and indifferent Israeli soldiers, documented in a report by the Israeli branch of Physicians for Human Rights after she died in 2004. Filmmakers said they used animation to make their grim subject more appealing – weaving a Mideast tale whose characters crisscross the Arab-Jewish divide. An Israeli human rights activist becomes Fatenah’s close friend and a love story between Fatenah and a Gazan man threads the story together. The film turns the territory into harshly colored scenes: an Israeli checkpoint, crowded buildings and the sea. “Fatenah” opens Wednesday in the West Bank city of Ramallah. It is the first animated film for commercial release made in the Palestinian territories, on a budget of $60,000 from the World Health Organization. Producers are sending it to film festivals abroad. The film highlights the strides of Palestinian filmmakers, who have made six feature-length movies in the past two years – despite no local funding, few experienced professionals and Israel’s closure system that prevents Palestinians from moving between the West Bank and Gaza, and which restricts entry to Israel. Director Ahmad Habash, a West Bank resident, couldn’t see most of the scenes he needed to create for the film. He paid a Gazan photographer to snap pictures of the coastal territory. For Israeli hospital scenes, Habash used photos from a Web site. While Palestinian films range from intense realism to oddball surrealism, most highlight life under Israel’s occupation, and “Fatenah” is no different. Producer Saed Andoni said he hoped to humanize the struggle of Gazans seeking medical care. The gravely ill must seek treatment abroad because doctors in Gaza’s ramshackle, poorly equipped hospitals cannot treat serious diseases. But it can take weeks for Palestinian bureaucrats to organize referrals and for Israel and Egypt to approve or deny entry. Gazans are isolated from the world by years of prolonged closure that was tightened to a blockade after Hamas militants seized power in June 2007. Supplies are scarce and some critically ill residents are left to die in Gaza. In early 2004, the 28-year-old woman who inspired “Fatenah” felt a lump in her breast but Palestinian doctors dismissed her concerns. One doctor told her having children would cure her lump, but the cancer quickly spread and she had to undergo a double mastectomy. Israeli activists had to lobby courts to let the woman enter Israel, because she did not have a valid ID – Israeli officials had halted procedures for Palestinians to obtain them at the time. She often missed appointments because soldiers wouldn’t let her cross into Israel. The climactic scene in “Fatenah,” where a female Israeli soldier demands she disrobe for a security check occurred in September 2004, according to the Physicians for Human Rights report. Weakened by cancer, the Gazan woman lay on the floor because there were no chairs in the border crossing at the time, the report said. She opened her long Muslim robe to reveal a T-shirt and stuffed bra to disguise her mastectomy, but was sent back to Gaza. It wasn’t clear why she failed the security check, the report’s author said. The Israeli military said it would look into the report’s description. The conservative Gazan father of Fatenah’s real life inspiration said he only learned of the film after reporters contacted them. He unsuccessfully asked filmmakers to cut a brief, dimly lit scene showing her breasts, fearing damage to his daughter’s reputation, even years after her death. 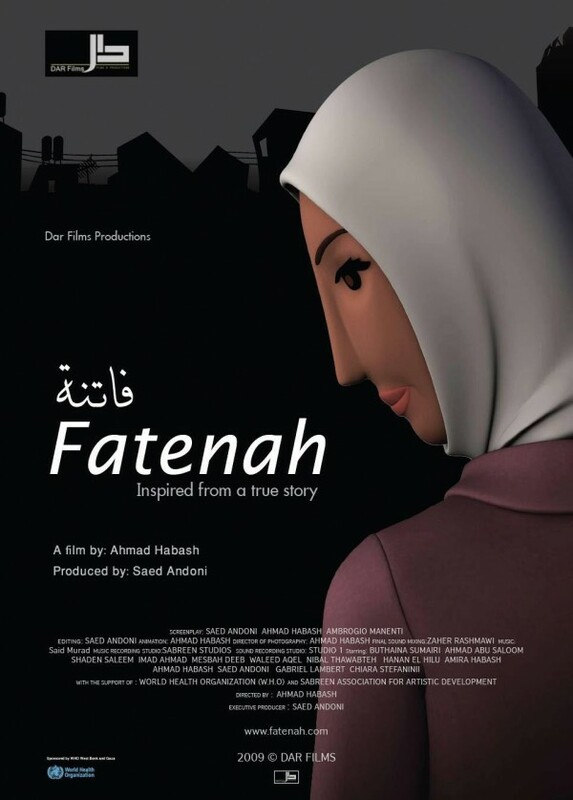 The father, who requested anonymity, also expressed concern about Fatenah’s innocent romance portrayed in the film. In real life, the Gazan woman hoped to marry her university sweetheart but told a reporter in 2004 that she didn’t expect to live long enough to marry. The family and filmmakers were not aware of the Gazan woman’s real-life relationship.